The Ford Mustang is - decades on from the launch of the original - no longer a forbidden fruit for us Brits. In 2015 the first examples of the sixth-generation Pony Car with - gasp - a steering wheel on the right-hand side landed in Britain, giving petrolheads that complication-free slice of V8 Americana they’ve been missing for all these years. At the time, I was ecstatic. And then I drove one. It wasn’t the slightly vague steering or the wallowy yet weirdly firm damping that disappointed me. No, I hadn’t expected a masterclass in driving dynamics. What I wanted was simple coupe thrills, only to have my hopes dashed by the one part of the equation I thought I could rely on. The engine. What I was expecting was a big, lazy V8 that made a great noise, only to find that the Coyote V8 needed quite a bit of revving to get the best out of it, sounding weirdly flat and uninspiring, and being hooked up to a less than brilliant six-speed manual gearbox. And as fun as Line Lock is, I can’t help but think software-controlled burnouts are just un-American. The facelifted sixth-gen Mustang with its louder exhaust improved the noise stakes while also bringing chassis improvements (and a much higher price tag), but I still don’t find myself drawn to it. Now, though, I finally understand the problem: it turns out I’m a Camaro guy. On a trip to California last year, I had a bit of time in a Camaro SS Hot Wheels 50th Anniversary Edition. 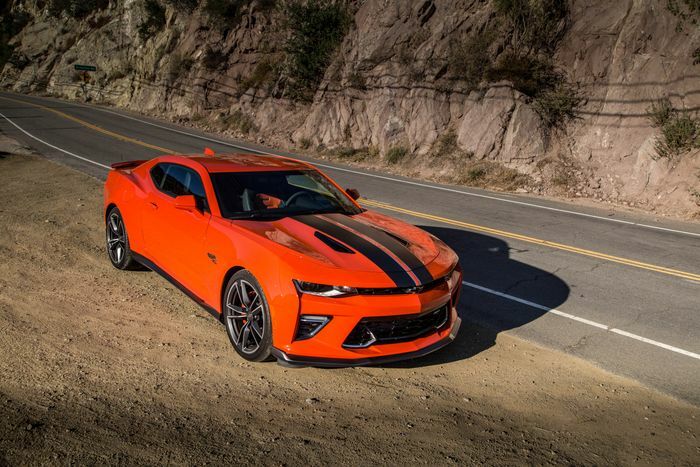 A $4995 option which was also available for the 2LT Camaro, it adds all sorts of visual upgrades like racing stripes, special paint, and 20-inch wheels, and all that does indeed make for a wicked-looking coupe. But I was more interested in the engine. It took only a part throttle application shortly after picking it up to find that the 455bhp, 455lb ft V8 was much more to my liking than the Mustang’s Coyote lump. It’s the same pushrod LT1 V8 used in the base Corvette, and it has multiple personalities. It’s moody and rumbly at low revs, lets out a delicious howl in the mid-range, and is creamily smooth at the top end. This is the kind of engine that livens up every journey, no matter how dull. Even the gearbox is better - the cogs themselves are too long, but there’s no arguing with the heavy, very mechanically satisfying ‘thunk’ of every shift. That could have been the end of it. I’d have happily punted up and down Highway 1 in that car, being greedy with the throttle away from every single traffic light and bouncing the noise of the LT1 off various rock faces. But it turns out the SS is a fine steer when you put it on some Canyon roads. Yes, it is nose heavy, and yes, something like a BMW M2 is more satisfying to drive on twistier bits, but the Camaro SS is very well sorted. The suspension verges on being too stiff, but body control is generally good. 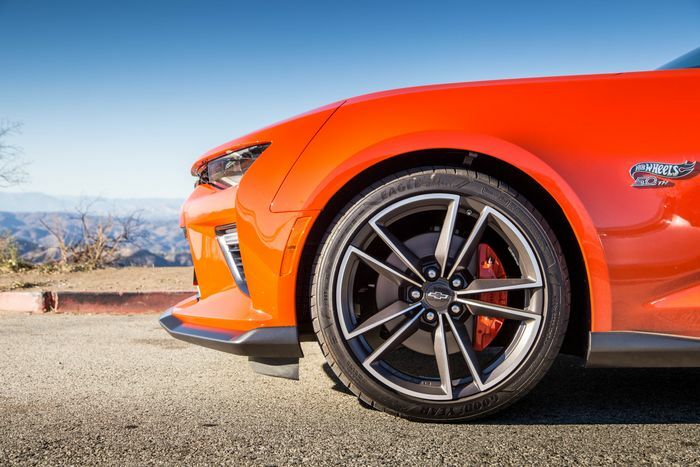 The front end is willing, and there’s far more traction from the rear than you might expect. 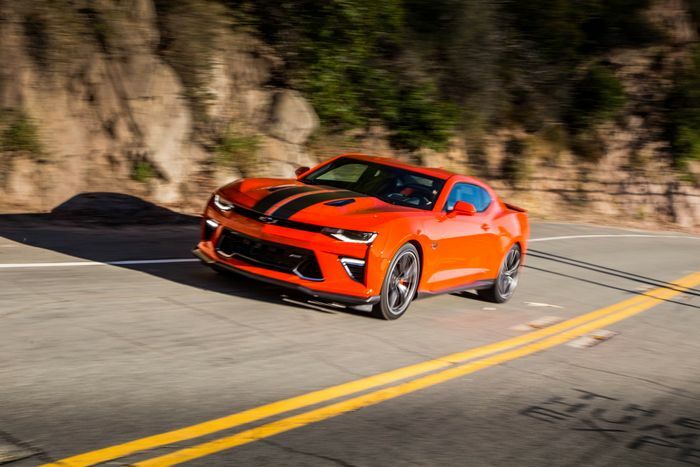 There’s something nice about the weight of the steering, too - it’s heavy, but it’s a natural-feeling heft that - along with the chunky gear change - makes driving the Camaro feel like it actually takes effort. Like the Mustang, the Camaro does have flaws. Despite appearing to be vast on the outside, the inside is conspicuously pokey. The window lines are bizarrely high, hampering visibility, and crucially, hampering your ability to open a window and rest an arm on the door while you’re cruising around. Which just seems the right thing to do in this car. Then there’s the infotainment screen, which for some bizarre reason is angled slightly down. When the light is in just the wrong place, all you can see is your passenger’s trousers. To cap it off, the navigation system itself isn’t brilliant. The Mustang does a lot of this ‘normal car’ stuff much better. It’s better packaged, and more useable day-to-day. But for all the attributes that should be the most important for someone buying a car like this, the Chevrolet has the Ford beaten. It’s a car of multiple talents. It has that feel-good V8 sense of occasion, while also standing up as a decent sports car. Finally, as an object, it just makes you smile. I even (whispers it) quite like the big-mouthed facelifted version. Ford’s decision to stick a steering wheel on the right-hand side of the Mustang and ship it to the UK is something to be celebrated. 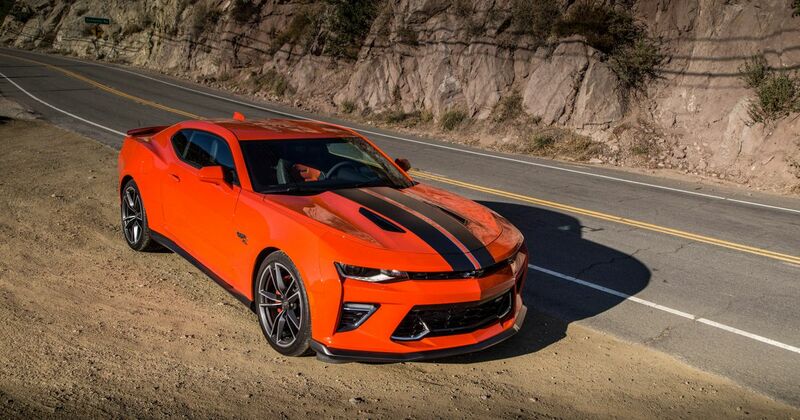 But I find myself wishing we were in a parallel universe where instead, Chevrolet did the same with the Camaro. Recommended car throttle shop Worldwide Shipping In The CT Shop Car Throttle Submit Your Videos To Get Featured On Our Social Channels Blog What Next For The Manual Jaguar F-Type After America Turns Its Back? Blog Why A Brand New Interior Is The Processed Meat Of Car Smells Blog The Hybrid Car Is Already Dying And Here's Why It Makes Us Happy Blog I'm Living With A Mercedes-AMG C43 For Nine Months: What Do You Want To Know? Blog Geneva 2019 Proves Ordinary Is The New Extraordinary – For A Price Blog The New Rush Of Affordable, Desirable EVs Finally Makes Sense Blog Everything Good And Bad About My £140 BMW E46 330i Blog Why Is Ford Resurrecting The Defunct Puma Name On A Crossover?